Queen's Mosque [or Rani Masjid], Mirzapoor, Ahmedabad. bl.uk > Online Gallery Home	> Online exhibitions	> Asia, Pacific and Africa Collections	> Queen's Mosque [or Rani Masjid], Mirzapoor, Ahmedabad. 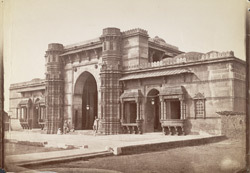 Photograph of the mosque of Rani Rupmati at Ahmadabad in Gujarat, taken by Charles Lickford in the 1880s, part of the Bellew Collection of Architectural Views. Ahmadabad spreads along the river Sabarmati and is Gujarat's capital city. It was built on the site of Ashawal village, which had a history of settlement for thousands of years. The Sultan of Gujarat, Ahmad Shah I (ruled 1411-42), built a capital at Ashaval, naming it Ahmadabad. The city flourished and was a centre of art and literature. It was annexed in 1572 by the Mughal emperor Akbar (ruled 1556-1605), and prospered as a major textile centre. With the decline of Mughal power it was taken by the Marathas in 1758, and finally went to the British in 1817. Textile mills established in 1861 led to it being referred to as the Manchester of the East and Ahmadabad remains an industrial powerhouse of modern India. The architecture of Ahmadabad reveals a fine synthesis of Hindu and Muslim elements, such as in the mausoleum complex of Rani Rupmati about whose life little is known. It is said that she may have been one of the chief queens of Ahmad Shah.